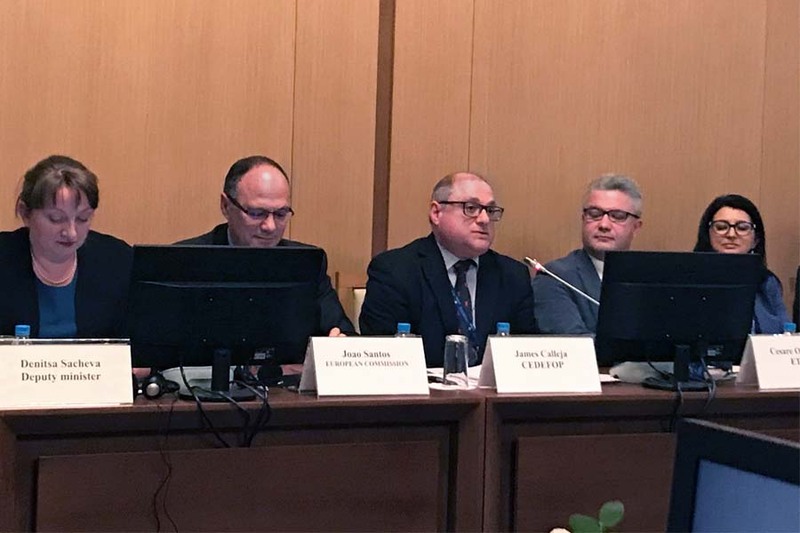 Cedefop participated in the meeting of Directors-General for vocational education and training (DGVT) and a high-level Presidency conference on VET in Sofia from 23 to 25 April. The DGVT meeting focused on improving graduate tracking systems in response to the Council recommendation of 20 November 2017. Cedefop Director James Calleja chaired one of four peer review workshops, which focused on how to develop effective longitudinal graduate tracking or multiple measurement points in graduate tracking systems. Cedefop’s head of department for VET systems and institutions, Loukas Zahilas, participated in a workshop dealing with graduate tracking tools as part of effective feedback loops between VET provision and the labour market, and Cedefop expert George Kostakis acted as rapporteur. In his opening remarks Mr Calleja identified the four issues at the heart of VET graduate tracking: students’ employability; flow of information on skills mismatches and labour market needs; career guidance, curriculum planning and forecasting of education and social needs; and data helping policy-makers improve skills matching and VET programmes. He emphasised the importance of combining administrative data with longitudinal graduate tracking studies to inform VET policy and provision. Timely data processing is crucial for a swift response to changing needs. VET graduates need to be engaged in surveys about their career progression and lifelong learning, while data protection restrictions that prevent the correlation of data from different sources need to be overcome. The Cedefop Director concluded that graduate tracking is an exercise which requires sustainable resources to achieve credibility and adequate periodic referencing. Both the reliability of data and the speed and regularity with which analysed data are published are of utmost importance for the timely development of VET programmes and qualifications. The objective of the subsequent Presidency conference ‘VET as a first choice’ was to contribute to the exchange of good practices and to promote VET as a first choice for learners. Mr Calleja was among the speakers of the introductory session, together with Bulgaria’s Deputy Minister of Education and Science and other Bulgarian government and social partner representatives, the European Commission’s DG Employment, and the ETF. ‘While the future is in the making’, Mr Calleja said, ‘the past has created a negative image of VET, whereas the present is packed with European and national initiatives which can put VET reform on a fast track and make it a first choice’. The European opinion survey on VET, presented by Cedefop expert Daniel Scheuregger, clearly illustrates that different countries have different perceptions of VET. For VET to become a first choice, several things must be in place. First, adequate resourcing is the linchpin of VET’s reputation. Second, the content of VET qualifications must meet the requirements of jobs. Therefore, it is imperative that VET offer a learning environment which includes work-based learning, apprenticeships and practical experiences, and that reliable assessment methods and quality assurance mechanisms be in place. Third, VET programmes need to be in tune with sectors of economic development in a world of fast-changing technology and progressing automation. Mr Calleja pointed out that VET needs rebranding in several Member States. Young people need to be able to ‘find their niche’ in lifelong learning after leaving compulsory education. Qualifications need to be practical and relevant to the world of work if they are to earn a positive reputation among employers, young people and their parents – this is what may determine the choice of VET over other streams of education. Finally, making VET a first choice is about finding a job and being able to grow and evolve. In conclusion ‘if citizens are encouraged to make VET a first choice, decision-makers, legislators and practitioners must ensure that they also make VET their first choice when planning and resourcing the sector’.